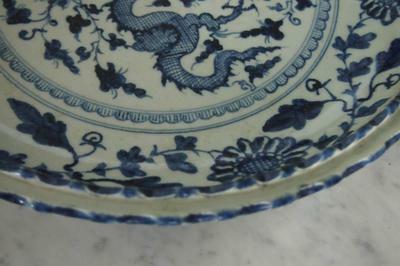 I appreciate if you could tell me the type and dynasty of this plate ? I doubt that your grandfather had it for a long time. In my view this is a modern fake, possibly not even made in China. The leaf decoration on top and below does not look right to me. The flower uses an element that was used in the Yuan dynasty. 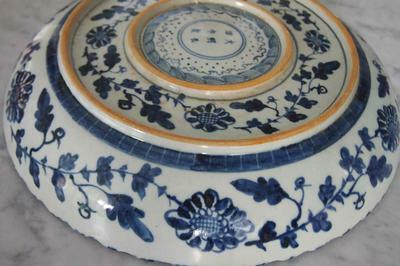 There is a double foot rim which would point to the early Qing dynasty. I cannot read all of the mark as the characters are too small, but it seems to say "Ming...". And, before all, the foot rim(s) don't look right either, in my opinion. I'm afraid I cannot help much with this. What meets the eye first is a leaf decoration which does not quite look like it should with antique Chinese porcelain. Even on these too small pictures the double foot rim looks too smooth and of the wrong shape. 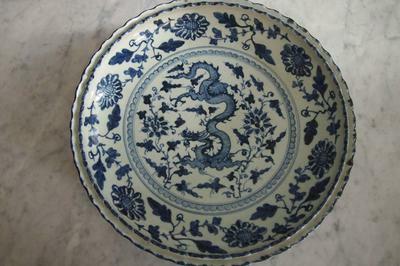 Although I cannot read the mark as the image is too small, the underside decoration and double foot rim also is a problem in my view, as it makes it more likely early Qing dynasty. 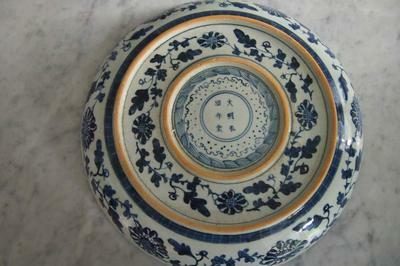 The mark seems to say Ming, but a certain part of the floral decoration seems to try copying a Yuan decoration. In my opinion this is likely a more recent fake, not necessarily made in China.